At the most recent Arria-formula meeting on Afghanistan on November 27, 2017, Barnett Rubin spoke on the importance of regional approaches in fostering development and peace. In his talk, Partners for Afghanistan: Linking Security, Development and Peace in the Central Asian Region. The People’s Liberation Army is the biggest single provider of troops for the United Nation’s peacekeeping force, known as the Blue Helmets. We seldom, if ever, see the PLA or its generals at United Nations headquarters, but we do see Ambassador Liu Jieyi and Beijing’s team of diplomats everyday in the Security Council dealing with the most serious of world issues. In five months in office, UN Secretary-General António Guterres, has so far publicly avoided challenging new US President Donald Trump. But on Tuesday, he threw the equivalent of a last-minute "Hail Mary" pass during a speech at New York University -- making the case for the US to remain committed to the Paris climate accord in terms that he hoped would change Trump's mind, by warning of a drop in the US's global influence if it pulls out of the agreement. India’s decision to boycott China’s Belt and Road Forum has reinvigorated the much-needed debate on the strategic relationship between the two Asian giants. This debate comes on the heels of the February 23, 2017 India-China Strategic Dialogue in Beijing, where the two states found, among their divergences, a convergence on Afghanistan that contradicts some of Delhi’s received wisdom. CNN's Fareed Zakaria in a recent report on the ongoing conflict in Afghanistan highlights Barnett Rubin's War on the Rocks article "It's much bigger than Afghanistan: U.S. strategy for a transformed Region". Whether launching a few missiles at a Syrian air base, sailing an aircraft carrier toward North Korea (or not), dropping MOAB, or sending more troops to Afghanistan, tactical demonstrations of U.S. strength not tied to strategic objectives sooner rather than later deteriorate into bloody demonstrations of futility. Considerable policy analysis has been devoted to bilateral strategic relationships between Pakistan and India, India and China, and China and the United States. But the strategic dynamics among these four nuclear powers cannot be understood or effectively addressed on a strictly bilateral basis. While Pakistan responds strategically to India, India responds both to Pakistan and China, which in turn responds both to India and the United States. Indo-US naval cooperation: steady as she goes? The US and Indian navies could carry out ‘benign naval and maritime activity’ during periods of diplomatic strain. On December 17, 2016 Barnett Rubin made a presentation on the subject of “Security and Development Along the Belt and Road Initiative” at a conference hosted by the Belt and Road Building and Central Asian Studies Institute of Shaanxi Normal University in Xi’an, China. Public Lecture: Are China and the United States Rivals or Partners in Afghanistan? 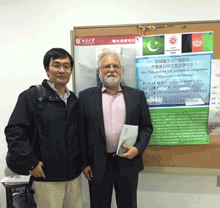 CIC Director Dr. Barnett Rubin gave a lecture to students at Peking University on Monday, October 27th. In his talk, he explores the ways that cooperation in Afghanistan can positively contribute to the overall US-China relationship. He also highlights examples of where that cooperation is already taking place and proposes a number of areas that might be particularly fruitful for collaboration in the future. Read the full lecture: Are China and the United States Rivals or Partners in Afghanistan?